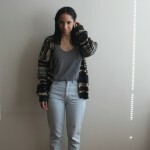 So today’s post is a bit different from my other style posts. I’m just gonna keep it real, I want to share how disappointed in myself I was for paying so much money for these dang overalls. Therefore I won’t share where I got them from :). Although I am happy to say I’m debt free, I don’t plan on spending this much on clothes anymore because I’m not trying to go into debt. It’s very easy, especially when you have a site where you do “style” posts, to fall into the trap of trying to get new things so you can post them. With all that said, my wedding is this September and this mom here is continuing to save her money to buy a house as well as just add to my savings period. But I do love overalls and you can find them in thrift stores for a good price. I also love that you can wear them with long sleeves such as thermals, a plain old t-shirt, or a sleeveless T like the one I’m wearing. My brown boots were thrifted from Beacon’s Closet for $14, that’s more of the price range I need to stick to :). Do you ever feel guilty about buying expensive clothes? I must be slow cause I didn’t realize you were engage. Well, CONGRATS!!! (even though I’m late.) My husband and I have been married 6yrs this september. I goes so quick! Why thank you @3566aeac4bad91a232f94abc0e12e2ab:disqus :). No such thing as late and your right, time does go by so quick. God bless you both! PS: I always feel guilty spending alon clothes. Lol. But I e up for it by wearing it alot and paying it right off that month. Yeah..lol, I better wear this a lot, so I can feel like I got my money’s worth! If the item is well-made, staple-worthy, and will be worn for years, there’s nothing to feel guilty about. Well put @twitter-17052480:disqus :). And when I have the extra money to spend after bills, savings account, etc… are paid then I splurge sometimes. But, if I thought that way every week about an expensive item purchased, I would be in debt easily. Then I would have no money to invest in experiences such as vacations, concerts, classes for hobbies I’m into, a house, etc…Just somethings to think about before we make those big purchases. One of the best pieces of advice I got was ” spend your money on experiences rather than material things, because those experiences are a true investment that last a lifetime”. I think as one gets older experiences are worth more than an item of material. 20 years from now do I want to say that I’ve traveled the world or my Louis Vuitton bag is holding up well? @64ea023c665573ddfb260fbd8441fe31:disqus amen! If we would keep track of everything we spend by writing it down, we would be surprised how many trips we could have taken with that money. Reality check…lol! When I did buy expensive clothes, I didn’t feel bad because I had the money to pay for them and didn’t have any looming expenses. Now however, I would consider visiting a high end consignment shop…why would I pay full price when I could get the item(s) cheaper???? @15c75661a8d5d0ad9fd8ed00c839a90d:disqus I agree. I must have the money and no looming expenses. I did however buy this at a time when I should have put it in savings for the next coming months. So I have to quickly check myself before it turns into a problem…lol. I like! you look great Nikisha. I feel like people are more disciplined with money when they have set goals in place. Are you planning to stay in the city when you buy a house? I am from Buffalo NY and when I saw the prices to live in NYC I nearly fainted. But it depends on the area too haha. Good luck with the wedding planning. Thank you so much @9dfcd69e5f3e4695a00324f1fe820418:disqus :). I am very disciplined with money, I believe how my mom raised me has a lot to do with it. I also think it’s because I don’t want to be a slave to debt and I do have set goals that require me to not spend :). It’s hellah expensive here, in D.C., California, Colorado, basically all the major states with major cities. We aren’t sure where we are going to move yet, but we do have a warm weather place in mind. But we are saving in the mean time :). Awesome post! I do often….ekkk.. I recently brought these 2 pairs of JC (Jeffrey Campbell) shoes (Damsel & Lita’s) I love love love them….but I’m like did I really just purchase these items with a credit card. I was so uggg that they will sell out again….but was it really worth the debt?!!!! Hey @facebook-100000072191738:disqus , clothes are never worth debt! A house and an education are the only things worth going in debt for, and with the mindset and income stability to pay it off in time. Thank you @ArialynnRose:disqus . I hope you get a deal, because I played myself…lol! Lol…I hear you! High heel shoes get on my nerves because I don’t wear them much, I don’t find comfort in them, and they aren’t worth the price unless they are thrifted. And no expensive tanks from UO, they always end up going on sale :). Being both an avid thriftie & occasional high-end shopper, it’s hard to resist when you come across a piece of clothing that’s damn well near perfection! My mum always says you have to look past the price tag, and picture yourself 2-3 years later. If you still see yourself wearing it, then it’s an investment.We sometimes buy 2-3 versions of the same thing over the years simply because the previous ones wore out too quickly.That said, thrift shops often have both advantages : quality + price tag, which is why I love them so!I do feel guilty after splurging sometimes, but if I’ve been quite “good” w/ my money until that point, then I try to let it go.PS : Nikisha, if those overalls looked as good on me as they do on you, then I’d have splurged too! Aww…thank you so much @5cb96fff275b3de438d089307105ddcb:disqus , your too kind :). It sounds like we are family because I do the same dang thing, if I love it I have to buy more than one because I will run it into the ground! Yes, the spur of the moment ones tend to be the worst @11331f33c7b12cb5ee0c01f59c35a070:disqus . Aww September, an indian summer wedding, nice. Miss grown-up you just brought me back to 1997. 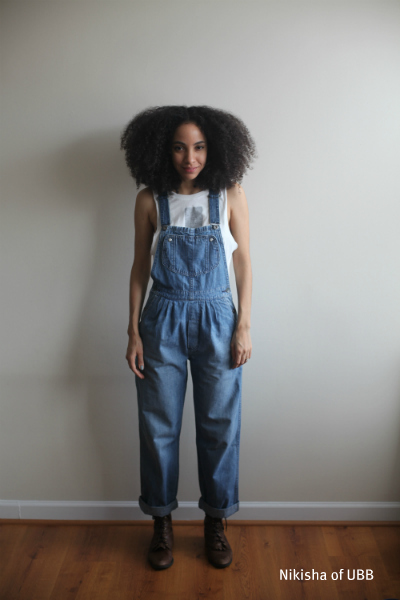 Had a pair of overall I wore to school at least once a week. And I am not as responsible as you. In college I would buy clothes like nobody’s busisness. Then grad school, with my part time job, AT a clothing store…well you already know. I was lucky enough that my mom would bail me out time to time. Now I am a very unstylish Ph.D student…sad. Haven’t shop any clothes in thE past 3 months, yes the last time I bought clothes was back in 2011…again sad. Thank you so much @ec5012ad27f0084ee631c58270e2521f:disqus, it is an Indian summer wedding . It’s not sad to be a unstylish Ph.D student; it’s more awesome that your a student over being stylish! I wasn’t stylish in grad school either and I don’t feel bad about it…lol. God bless you! Thank you Nikisha. I know I intend to get through this Ph and then I can worry about style. God bless you too pretty lady. We can all do better @eb465bc6cd5f7a2325169786acc9ba80:disqus :). No offense but those overalls dont do you any justice!!! No offense taken @55b21e6c29957d7c243da2f13c82ee1e:disqus :). Omg @SabahA:disqus !!! I know that song for sure! I love that song! I’m just really horrible with remembering names of songs from a long time ago :-P. Thank you love! yes! i try to stay off of zara and urbanoutfitters because they are not in my price range. luckily i have a vintage type of style so the thrift store is equivalent to those stores in style and i can alter the clothes with my sewing machine to make them look similar. @cee:twitter I love Zara and Urban so I know what you mean! How blessed are you to know how to use a sewing machine for alterations. My sewing skills aren’t that deep, because if they were I would be on it! All I can do is sew up some rips and holes…lol. :). Oh wow @9dfcd69e5f3e4695a00324f1fe820418:disqus , you found some steals! And that waist line in my overalls your talking about, I think that’s what I payed for…lol. The cut of the overalls was so unique, that’s the main reason I splurged :). I don’t usually feel guilty, because I know that pair of shoes, or that pair of jeans are going to last years & that I’ll get tons of wear out of them. Thank you @f0fb57fb63e05b15b9528d3f43448f9c:disqus :). Your right though, jeans last for sooooo long! yeh, i feel guilty occasionally about my shopping but i get over it quickly. lolz. I love overalls even though I’m ageing out of the demographic I think.. i still can’t give ‘em up! Its really very easy to find clothing stores online today. But the main thing is that which one to trust and blogs like this really very helpful for peoples who wants to do online shopping. For those who wants to buy latest cloths from online stores such blog are really useful. They provides right information for which to choose or which to not.